LiveAgent is a leading helpdesk support app that combines multiple channels into a single compact package. The system includes email support, live chat, and social media integration (Twitter and Facebook). It is a robust helpdesk solution that offers essential features such as file sharing, contact forms, gamification, statuses, POP3 accounts, and more. In this article, we analyze the LiveAgent pros and cons to give you a good idea of the solution’s capabilities and benefits, which can help you gauge whether it is a suitable software for your business needs. 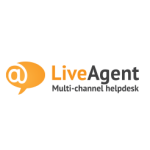 LiveAgent is considered to be one of the best helpdesk solutions in the market. Our SaaS experts closely analyzed the software and gave it an impressive score based on its main features, customization, integrations, customer support and other aspects. The vendor provides flexible packages that can suit the budgets and needs of both small and large companies. Plus, there is a great 14-day free trial plan that enables you to try the software’s functionalities free of any cost. You can use the ample free trial period to understand how the system works and how it can help you boost your company’s efficiency and productivity. Users can easily sign up for LiveAgent free trial here. LiveAgent is designed to be a simple and intuitive app, making it easy to learn and use effectively. The software’s interface elements are well planned out and easily accessible, making it easy for users to master the system in a short time. The software also offers a host of benefits to its users. The fast setup allows companies to quickly reach and engage existing customers and prospective clients. Users can interact with customers in real time. The software provides a universal helpdesk inbox which stores all customer requests which makes it effective and easy to manage responses to requests. You can provide solid customer support when your chat agents are offline through the customer portal. 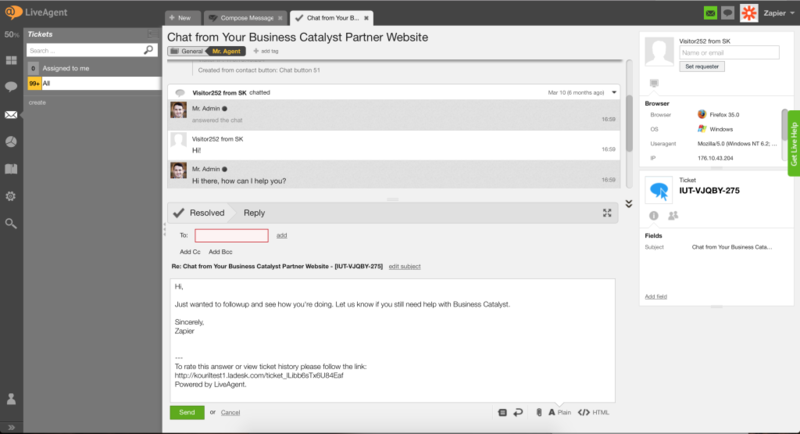 Plus, you can use the all-in-one support ticket platform to easily manage customer requests. You can find more information about LiveAgent features in our detailed review of the software. LiveAgent empowers even a small team to easily and effectively manage a large volume of tickets. The agents can use features such as the universal inbox, chat routing, rules, live chat widget, and knowledge base to handle a high number of requests. The universal inbox stores all requests in a single place to enable easy sorting. Social media posts and emails are automatically changed into tickets. You can set rules to quickly route tickets to the right business unit. For example, repetitive queries can be routed directly to an FAQ page, while billing tickets can be directed to accounting. Rules can be used to automate processes such as creating new tickets, changing ticket tags, transferring tickets, and rating agents. LiveAgent integrates Facebook and Twitter with its ticketing system. You can respond to all your keywords and brand mentions in social media in a single place. Plus, the social media integration helps users to track and monitor multiple social pages in real time and respond quickly. You can archive social media posts as tickets to be used for future reference, as leads for example. It is also possible to easily categorize various posts, and decide whether to use them as marketing or content data. LiveAgent provides a host of valuable services to its clients. You get full lifetime 24/7 customer support even if you are a small customer. So, even if you subscribe only to the basic Ticket Only plan, you get full support. The vendor responds promptly to one-premise licenses and resolves concerns within 24 hours via phone, live chat, or email. The support agents are based in-house and not outsourced. This guarantees clients native expertise and faster resolution time. Customers can escalate inquiries even up to the level of development head and CEO. This is essential for complex queries that need a quick high-level decision. LiveAgent’s pricing packages are pay as you use. This means the plans are ideal for both small startups and large companies. You can start with the basic ticketing and email support with three agents, and scale up as your company grows. What’s more, you can scale down to the basic package during slow seasons. You don’t have to pay for added license for additional websites. You can use one license to embed separate knowledge portals, contact forms, and chat buttons on all your brand sites. This makes it tidy and easy to manage all your support channels under a single roof. Finally, if you want to control tech security, you can host the software on your own server as the vendor also offers a standalone application in addition to the SaaS services. The software is easy to implement even in large teams. It offers the ability to self-host behind the firewall. You can customize plenty of features and tailor them for your business needs. The vendor listens hard to feedback and constantly works to improve the software. You can use the API for development. The self-service setup is very useful. The pricing is reasonable, there is quick development of new features, and there are no bugs in the system. For more info on LiveAgent pricing check out our detailed analysis of the app. The mobile app’s interface could use some improvements, though it is still convenient to work with. The software could support more integrations with business systems to boost its effectiveness and usability. None of these problems affect the overal impression of the software and the vendor is already working on improveing their system. Our detailed evaluation of LiveAgent pros and cons shows that it’s a leading help desk service that is definitely one of the best solutions of this type in the market. The vendor offers flexible pricing packages for the needs and budgets of companies of any size. There is also a convenient 14-day free trial plan that lets users test drive the system’s features. You can easily sign up for LiveAgent free trial here. Will it just be effective in a PaaS setup as it is in a Saas setup?